Towards the end of the 73-74 season, Liverpool were developing their trademark passing game to an advanced degree. Hall, now in full swing, positively purrs at the memories of Shankly's last months as manager. "Two matches stand out for me that epitomised the way we wanted to play. The 1974 F.A. Cup semi final replay at Villa Park against Leicester City was the first. It was a great display of collectiveness, of each player helping out each of the others. Then came the subsequent final against Newcastle United. That was the team performance that became the model, where we got a grip on the game, slowly but surely controlling it, then scored the goals. That became the model the club worked to for the next 15 years. It was the pinnacle of team performance. What the Dutch did in the 1974 World Cup, we were already doing." There's an acknowledgement too of the role the other boot room members played in the creation of this world beating style. Bob Paisley, Joe Fagan, and Ronnie Moran were an essential part of the Shankly story. Though already at the club when Shankly joined in 1959, Shankly had the foresight to see that he could work closely with them and never felt the need to bring in any of his own people. It's a factor Hall clearly thinks was crucial in the success the club subsequently enjoyed. "Bill didn't start out with a grand plan. The thing evolved and the input came from the team of coaches. They all saw and learnt something and put it into the pot and that's what the boot room was all about. It wasn't just a small room where the boots were hung up on pegs, that was only the physical manifestation. To me the meeting of minds was what it was really about. Visiting managers would pop in to the room and try to glean information or an insight into the growing mythology that was surrounding the success we were having." Hall chuckles at the very notion that there was something unscrupulous or supernatural going on in the bowels of the boot room or even at Melwood, the training ground which had always had a lax policy of letting anyone who wanted to walk in and watch the training sessions. "No, there was no secret, and that was the biggest myth of them all wasn't it ?" There never was any secret or magic recipe to Liverpool's success. The key was always simplicity and it was banged into the players relentlessley on the training ground until it became automatic. The simple passing game that Liverpool were playing was programmed into every player at the club so that when one dropped out and another slotted in, there was no noticeable drop in playing standards. With things running smoothly and Liverpool on the brink of steamrollering across Europe the club were hit with the massive bombshell of Shankly's retirement in July 1974. It rocked the club to the core. Citing tiredness and a need to spend more time with his family as the main reasons, Shankly had had enough. 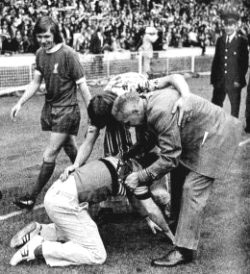 Hall has his own personal theory of what was going on in Shankly's head at the time. "The pressure of the football and the producing of winning teams he could cope with because he'd lived with it all his life, but he was an icon, a legend in this city and people hung on every word he said. The pressure of that just got too much. If he didn't have that element of it and it was just football I know he could have coped with that because he loved it." 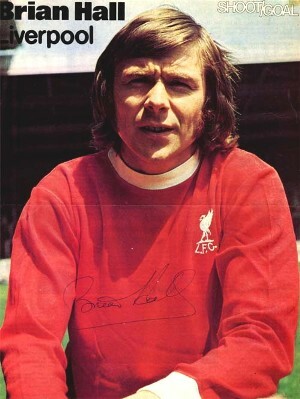 Reflecting on a colourful period in the history of British football, Hall has come to treasure the time he spent at Liverpool as a player. "It's not just a glib line when I say it was a privilege to be here, to be part of that whole scene in the 1970s and to have worked with such powerful people. Shankly, through his strength of character, did something utterley unique in the history of any football club, welding together the fans, the players, the red half of the city, into something that was extraordinary. The whole Beatles thing was going on, the fans had their music scene that was setting the world alight, and they had Shankly and a great football team that was winning cups. He was the most powerful person I've ever met. Something special and wonderful happened." The endless fascination of Shankly to many of us lay in his ability to use psychology to build up players. When I venture that much of what he said, particularly about the standard of the day's opposition, was plainly outrageous nonesense, Hall leans across his desk and quickly counters, "It wasn't something I ever considered until I'd finished playing. Bill used to say 'All you need is the grass and a ball', and I never used to understood what he meant. We'd be walking out at Melwood in the freezing rain and I'd be thinking 'flippin' eck', but he would just love playing and he expected other players to be the same way. To him, putting on the red shirt was about the will to win. He had the ability to look you in the eye and know whether or not you were self motivated. That was what he wanted to see in a player because that's what he was like. How a player looked on a Tuesday at Melwood was important to Shanks. That's when you found out what made him tick and I don't think that's changed." It's clear that Shankly's motivational secret was to surround himself with players who thought like he did, players who wanted to play and win, players who knew they were better collectively than the opposition. For better or worse, the game has moved on apace since those heady days of the 60s and 70s. Hall insists the club is not too mired in the past to get to grips with the modern game and the business it has become. His cluttered office, stuffed full of cards and notes and letters from all corners of the world bears testament to the global pulling power LFC now wields and the need for the club to acknowledge and nurture it's standing amongst it's supporters, wherever they are. "This club is one of the biggest in the world. We might have had a dip on the field of play, but it'll come back I'm convinced of that. Shankly was the starting point for all of this. He set the standards that all future sides here are expected to emulate, but it's no use kidding ourselves that we can just carry on doing what was right to do in 1965. We have to move on. Shanks and the other boot room guys knew nothing about dieticians and what we would call today sports science, but the standards they laid down are still the standards today for this club, even if the methods taken to get there need to be updated." There's a growing sense that the club has made it's peace with the fans over Shankly and his legacy. For years there existed a belief that the club had not treated it's greatest ever employee with quite the reverence he deserved. Only now, as the dust settles on the boot room era and new brooms sweep across the club with Gallic fury are the club and the major instigator of it's rise to world fame fully reconciled. In a typical, defiant, victory salute pose, the magnificent Shankly statue stands astride the entrance to the new visitor museum underneath the newly rebuilt all-seater kop. A moving combination of old and new. On cue, Hall brings the interview to an end and we make our way out of the office. I casually enquire if he will be at the game tomorrow, an away fixture at Derby County's Pride Park. "No, I spend too much bloody time at the club during the rest of the week!" You know he doesn't mean it to sound the way it comes out. He is clearly still in love with Liverpool Football Club. Outside, the car park is quiet again, and the sun has long since dropped out of sight. The security man jangles the keys to the office and informs us that he is just about to lock up for the night. It's been another long day for Brian Hall. I drive out of the ground and pass the Shankly Gates and the Hillsborough memorial flame, sitting oddly, yet serenely together. A clutch of young boys, with no memories of Shankly and his days of triumph, stare at the flame and read the messages clustered around the memorial. Maybe one of them will be the next Michael Owen I muse. In my rear view mirror, I see one of the heroes of a bygone age finally leave for home. He's a clever man Brian Hall, because he knows he has been privileged. "If you'd seen Anfield when I came it was the biggest toilet in Liverpool. I had to bring water in from Oldfield Road. It cost 3,000 pounds. There was no water to flush the toilets."